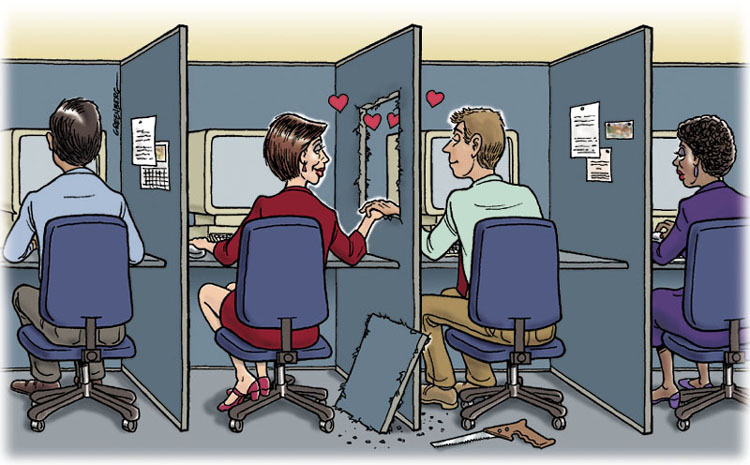 Is it morally acceptable to date a colleague – or even worse – your boss? At work a certain standard of professionalism is to be maintained. Colleagues rarely turn into friends. It is a different kind of relationship. One that ends with your shift. Or does it? Once you allow a colleague to step into your private life, confusion ensues. That professional relationship between two colleagues or a boss and an employee is easily disrupted when business and pleasure amalgamate. A drink, a dinner, a breakfast in a foreign house. The start of a new relationship is exciting enough without the complications of being involved with someone from work. Couples usually separate after their morning routine and are reunited after a busy day at the office. But for the work place love affair it is only the beginning. It is the ultimate test. To be around each other constantly, intensely. Hour after hour. Breathing in his perfume as he leans over your desk to clarify an issue beyond your expertise or walking past him on the hall way as your eyes meet and you reminisce the magic of the previous night. Your conversation is light – casual. ”How are you? Are you busy today?” No sign of the passion you know is slithering underneath the surface. It is a convincing mask of good behaviour. It is tempting to glance at his desk every so often. Your favourite distraction. Just to catch a glimpse of that smile. But you are different people here. Not lovers, holdings hands and an embrace of souls. But two people reaching for the brightest star of the career ladder. Working together, sleeping together. Yay or nay? One might argue that a tension arises after that first night. How are we to act at work? Will we reveal our romantic attachment to one another or will it be a clandestine love affair? Who are we to tell? Friends? Maybe. Family? Maybe. No one? Might be best. Who do we trust? Many opt for secrecy over honesty. Why? They might not understand. They might disapprove. They will talk. The more important he is the more they will gossip as if you were characters from a soap opera or the next door neighbour known for her promiscuity. So a distance is created between the two lovers. For the sake of work. The truth is covered up with an indifference that can be confused with estrangement. At least one of the two will be unhappy with the neglect that follows. Whether it is worth it, is another question. And how will you deal with the fact that your relationship is the hottest topic of conversation amongst colleagues? The whispers, the looks. Your private life exposed. Do you even want to know what they think? Probably not. But a small part of you cannot help but be curious. And what if the boss is the man you love? Some might consider it inappropriate to date a superior. They might wonder if it is that promotion you seek rather than love. And it is somewhat unusual for your lover to correct your mistakes, not to mention awkard. But a necessary evil. The day ends and the embarrassment fades. When the two lovers walk home after work, chatting about difficult customers or issues that had to be resolved, they switch roles upon entering the apartment. Work leaves the conversation and more often than not, the conversation makes way for passion. He unbuttons your coat and nuzzles your ear as you clumsily remove your boots and sit upon the bed, waiting for him to join you. Gone is that common interest that dominates your discourse: Work. It’s dating by association. All that remains now is the will to be close to him. For his hands to explore your body and keep you warm. For the night to stay so morning will not transport you back to that workplace of indifference. But it will. Ready yourself. >I met my OH at work – we didn't tell anyone until we were sure it was going to work out. >Lucky you! Most relationships that start at the workplace fizzle out.